Cragg Vale from Mytholmroyd on the B6138 road proudly claims to be the longest continual ascent in England. 968 feet of climbing in 5.5 miles. It is not steep, just a classic long drag – a power climb with an average gradient of just over 3%. 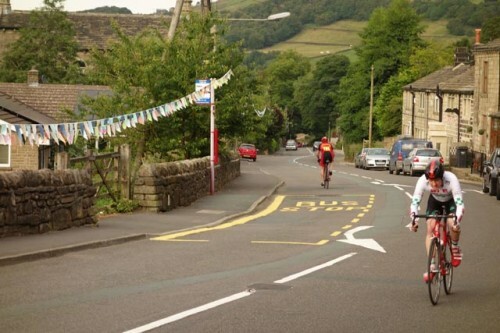 In a few days, the Tour de France peleton and whole caravan will be passing up these slopes. 198 riders, and goodness knows how many support vehicles and supporters. 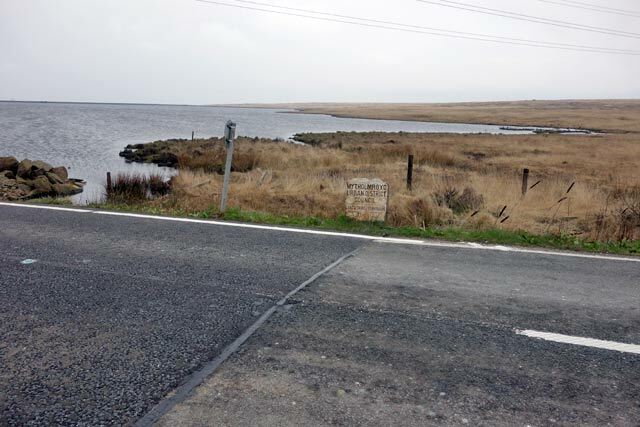 Compared to the Alpine giants like the Col du Tourmalet, Alpe d’Huez and Hautacam – Cragg Vale is little more than a mound or hillock, a minor pinprick on the map. It won’t feature too much in Team previews. But, it’s still a good test and a good place to watch. The peleton will be strung out – 5 miles of uphill, is hard in anyone’s book. 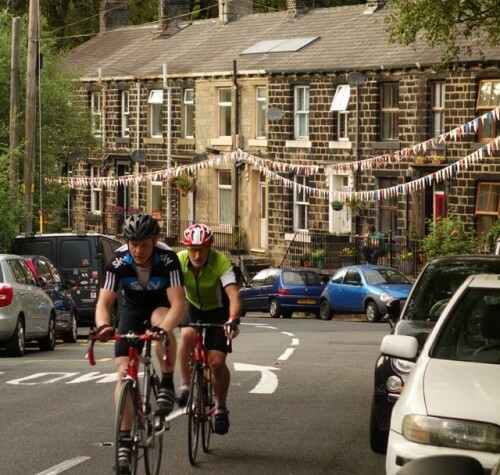 For the riders, it will be about getting a good place in the peleton for the upcoming climbs, such as Holme Moss and Côte de Greetland nearer the finish. I’ve ridden Cragg Vale once in training (with a huge tailwind), and I jumped at the chance to race a hill climb a week before the big race. 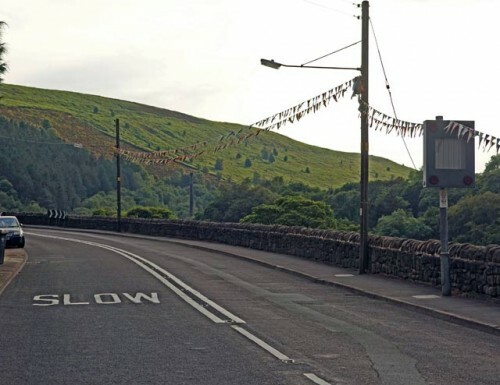 The local community are really getting into the spirit of the tour – amongst other things, they are going for a Guinness world record for the longest stretch of bunting – 5 miles uphill of bunting. It looks good. Bunting was put up all along the route. Whilst at the start, a member of the public asked seriously if Bradley Wiggins was in our race. They thought they had just seen him. I replied, offhand – no, it will be just someone wearing a Team Sky replica jersey. And indeed there was a rider in the ‘come and try it event’ wearing a Team Sky jersey. However, back at the HQ, I heard again the rumour that Bradley Wiggins did indeed ride up Cragg Vale that evening; and according to the extremely unofficial rumour mill, I heard he did a ’12’. Maybe that was just a guess from projected power figures. 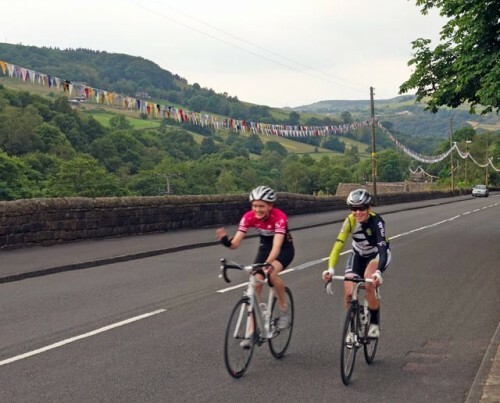 More concrete was a sighting of recently crowned British time trial champion Emma Pooley; Pooley was seen training on the slopes of Cragg Vale – surely you couldn’t have both national TT champs training on Cragg Vale on the same evening? 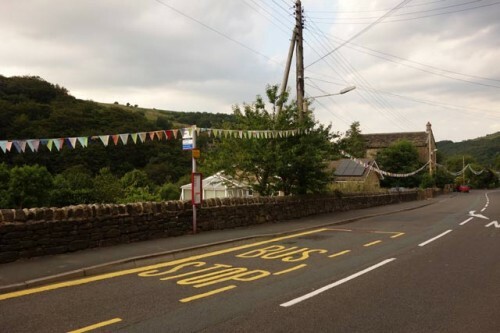 It was very good of the Mytholmroyd community to put up bunting for the YCF hill climb – It’s definitely set the standard for future hill climbs. I suggested to a local they leave it up for a few days, as I hear another big cycle race is coming along soon too. 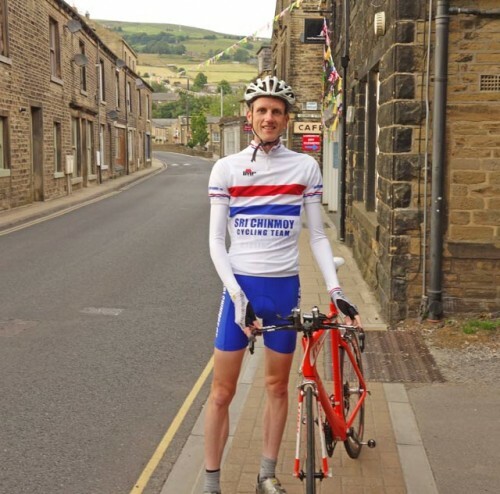 Anyway, national TT champion or not, it was time to concentrate on the CTT open hill climb – it may not be the Tour de France, but it’s still based on very similar principles of cycling really hard, until your legs hurt quite a lot. With an average gradient of 3%, I thought a TT bike would be quicker. This was good because I only bought one bike up to Yorkshire my TT bike. My Zipp 404 has dodgy bearings, so I chose to use the disc wheel. It meant I was in full bongo bongo aero mode. TT bike, disc, even Kask Bambino aero helmet – though I wore a helmet primarily because my mother had turned up to watch. I did toy with switching the ridiculously heavy Adamo Saddle with my super-lightweight Tune Korvum Hill Climb special. It would have saved 300 grams, but I decided it wasn’t worth the effort of changing saddle height e.t.c, and it was better to keep with saddle I’m currently used to. With no concessions to weight, I was hoping aerodynamics would help – especially on the exposed upper slopes. The weather was near perfect – it makes a change to do a hill climb on a calm, quiet summer days The wind was almost non-existent, you couldn’t work out the direction of the very feint breeze. I started off fairly fast and got tucked into the aero position. I stayed on tribars for most of race, apart from the steepest section through the village. I made the biggest efforts on the lower slopes, where it was steeper. The last 3km are very gentle, and almost inevitably the power ebbs away – partly because the legs were tired, partly because it’s always easier to get higher power figures going uphill. I caught no. 57 and no. 58 quite quickly. But, it took a long time to catch no.59 (Ben Jacobs Albarosa CC) For a long time he was dangling in front of me; it proved a useful target to keep up the effort for these last parts of the climb. Ben ended up with 2nd place, in a good time of 15:29 (just outside old course record of 15.15). I stopped the clock in 14.19. which took nearly a minute off the course record. Some said it was slightly faster the previous year because there was a tailwind. But, it was still a very good day for racing. It wouldn’t surprise me if Bradley Wiggins or the peleton in full flight could do the climb in 11-12 minutes. We shall be able to see on Sunday; they may take 15 + minutes because it’s quite a far out from the really serious business end of the stage. Thanks to YCF Federation for putting on good event. The peleton didn’t climb Cragg Vale at full pace. There was a feeding station at the bottom of the climb, and there was the small matter of the other 200km and 20 climbs! 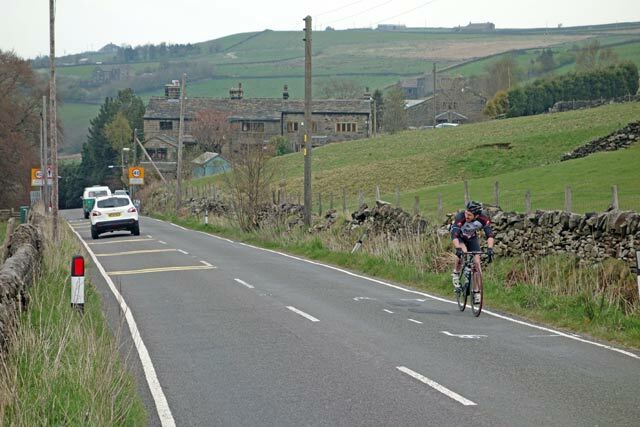 According to Strava, David Lopez of Team Sky climbed the Cragg Vale hill climb segment in a relatively steady 16:52. I should add Dave Haygarth Planet X/On-One rider rode up Cragg Vale 22 times one one day. 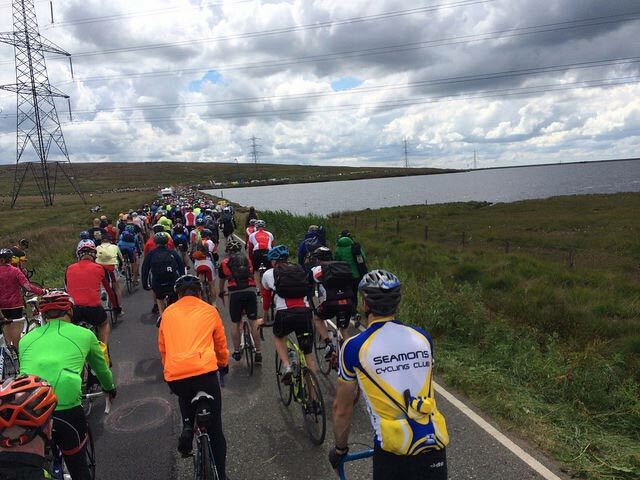 Is Cragg Vale really the longest continual ascent in England? 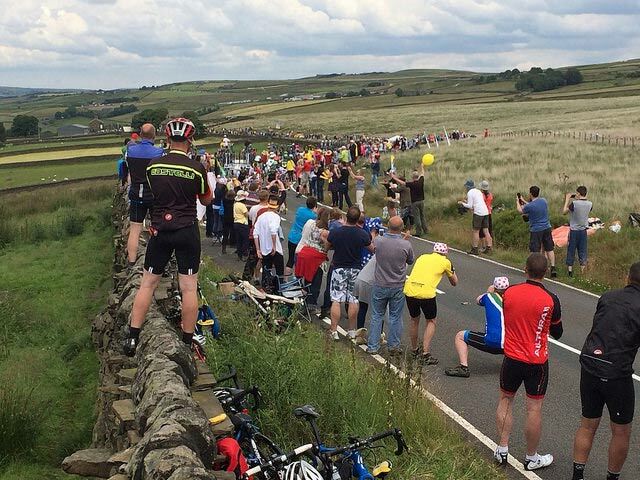 Having done both climbs, I would say, Cragg Vale deserves title of longest continual hill in England. Even if technically – Henley – Pishill is a longer continual ascent. I think Cragg Vale deserves title of longest continual uphill hill. Though it is a little arbitrary, and there would be nothing to stop Henley County Council putting up a sign saying longest continuous ascent in Pishill, but I doubt they will. Great time – I was pretty happy with 19th place, though as usual the next day was thinking “I could have done better”! Great event, couldn’t have been better conditions and the TdF good feeling seems to have really taken over. I also encountered one very confused local who wondered if we were touring France, leaving from Cragg..! Well done Tejvan, great “warm up” for the hill climb season. Things looking good. Great write up and awesome time. Nice one. Quote of the year. Thank you for making me smile once again Tejvan and well done on the course record. Enjoy the tour. I hear that the usual donkeys dressed in the leaders’ jerseys have been replaced by sheep. Brilliant! Another interesting read Tejvan- thank you. Can i ask where you hear about Hill Climb competitions?..although i expect a rider of your ranking is probably invited to most of the best events ! Are hillclimb events/details only found in the ‘time trial’ book?